History would call her Jeanne d'Arc, with a subtitle "The Maid of Orleans." The French would call her a saint, and the English would call her "witch." You can call her the centre of an intriguing game. Even in full armour, she still looked like a young girl, who somehow maintained a soldierly bearing while surrounded by men who had done nothing but war all their lives. She convinced an unconfirmed king to give her an army and led that army to victory, confidently sending the English commander her demand, "Render to the Maid, sent by God, the King of Heaven, all the good towns you have taken and violated in France!" Now you have the chance to delve into the mystery of the Maid and the making of France, with a rendition of the chaotic slice of the Hundred Years era when the biggest question was just how many separate countries "France" might become. 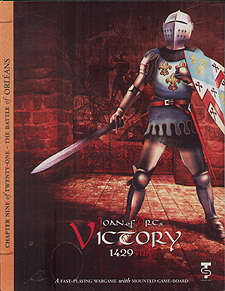 The game covers the entire campaign of the siege and relief of Orleans, with one-month turns beginning in April, 1429. The French player must consolidate his polyglot army and its inspiring leader, while dealing with Jeanne's "voices" via an events table that leaves him feeling slightly out of control. The English player has to deal with Scots and herrings and trying to resist the "help" of an unwanted Burgundian ally. Both players face the challenges of making siege and open-field combat work for them, in an era where artillery and charges by armoured knights belong on the same battlefield. Will the English make France little more than their "eastern counties," with a Balkanized set of small kingdoms? Or will France become France? The decision is yours. No two games will ever be alike.